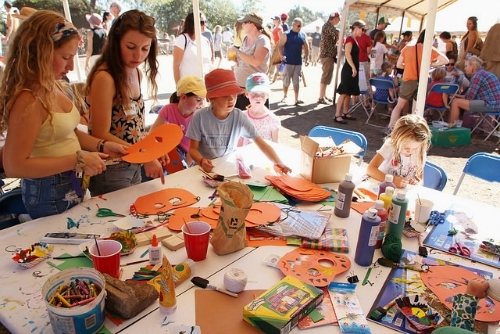 The kids' crafts table is always a well-attended venue at the annual Harvest Festival at the UC Santa Cruz Farm, held this year as part of 50th year festivities. Celebrate fall’s arrival with pumpkins, music, great food, a fall plant sale, farm tours, and much more at the UC Santa Cruz Farm & Garden’s Fall Harvest Festival, Sunday, September 27, from 11 a.m. to 5 p.m. at campus's 30-acre organic farm. The festival features live music from bluegrass to reggae, including headliner performances by Bean Creek and Ancestree Reggae. Also on tap: hay rides, kids’ crafts, workshops, pumpkin and produce sales, and campus and community group information tables. Visitors of all ages are invited to sample apples, enter the pie baking contest, try their hand at pressing cider, scale the climbing wall, and enjoy locally sourced, tasty treats. For the first time the festival will also feature a plant sale with organically raised plants for your fall garden, along with organic pumpkins and other fall produce grown at the UCSC Farm & Garden. Workshops on making salsa, growing and making cut flower bouquets, saving seeds, and preparing your garden for fall and winter are also on the schedule, along with tours of the farm and an herb talk and walk through the garden. Admission is free for UCSC students, kids 12 and under, and members of the Friends of the UCSC Farm & Garden; general admission is $5. See below for a full schedule of the day's events. The Harvest Festival is cosponsored by the UCSC Center for Agroecology and Sustainable Food Systems (CASFS), UCSC’s Measure 43, and the Friends of the UCSC Farm & Garden, with major support from Driscoll’s. The Sierra Club will provide free valet parking for bicycles. The UCSC’s OPERS program and College 8 are also supporting this year’s event. For directions to the UCSC Farm, visit the CASFS web site at http://casfs.ucsc.edu/about/directions. Free parking will be available at the Campus Facilities and Barn Theater parking lots, and a free shuttle will be available. For more information call (831) 459-3240 or email casfs@ucsc.edu. Ben Davis, acoustic guitar 11:15 a.m. – 12:30 p.m. The CASFS Farm & Garden Band 12:45 – 2 p.m.
Bean Creek 2:15 – 3:30 p.m.
Ancestree Reggea 3:45- 5 p.m.
Tours of the UCSC Farm – Farm & Garden docents 12:30 p.m. and 4 p.m.
Salsa it Up! Salsa Making Demo & Tasting - Alyssa Billys, Food Systems Working Group 1:15 p.m. and 2:15 p.m.
Herb Talk & Walk through the Garden – Darren Huckle, Western/Chinese herbalist & licensed acupuncturist 1:30-2:30 p.m.
Pie entries accepted September 27, 11 a.m. - 12:30 p.m. Winners will be announced at between 2 and 3 p.m.
All pies must be entered by 12:30 p.m. Sunday, September 27, at the Fall Harvest Festival, UCSC Farm. For questions or additional copies of the rules, call (831) 459-3240 or e-mail casfs@ucsc.edu.